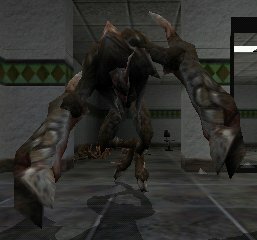 A Behemoth is a common enemy in Blood II: The Chosen that does not appear until it appears as the boss of chapter two in C2L9: The Underground. They resemble a large, gangly gorilla with rock skin and giant forearms (some have said its structure resembles The Cloverfield monster). They will fight anything it comes across, including fellow monsters (this can be seen in the chapter three level C3L8: Cabalco Enterprises 3, when a Behemoth and Cultists get in a firefight in the lobby). They attack by swiping with their pincer arms, and can send out a ranged shock wave attack. They commonly appear alone, or in packs of two at harder difficulties and later levels. Although fast, they have trouble following their targets due to their size. When near death, it will cry out in pain, and start attacking the ground to remove any items sticking to it (such as The Orb, or bombs). Effective weapons include explosives, the Insect-a-Cutioner, and energy weapons. Another good strategy is to climb to an elevated place and snipe it. This page was last edited on 12 May 2018, at 21:10.